Editor (Sara)’s note: For the first time in saratreetravels history, we are proud to welcome a guest blogger to our travel universe – my (tied-for-) favourite travel partner and mother, Mary!! Sara and I talked about doing a major trip, but her idea and mine of a major trip were two different things. When she asked me where I would like to go, I stretched it to my biggest dreams I could imagine of what I could do in my lifetime. I suggested wild things like a train trip across Canada, or sitting on the beach in Hawaii (which by the way was slowly being covered by lava). I stretched even farther to the Alaskan cruise up the West side of our fair country. Editor’s note: Small?! Absolutely not how I would describe my mom’s dreams… her life has been my inspiration to dream big! Now my vision was set farther. Europe was never in my thoughts for a trip I could ever do in my lifetime. Now I had the ticket, just had to come up with an agenda. Sara asked me, “NOW what do you want to see?” I threw out things that I had dreamed of, again, never expecting to see them happen: The Coliseum, the Vatican, Pompeii, Venice, maybe a side trip to Ukraine to see dad’s family again. Sara took my ideas under advisement, and came up with an agenda of almost three weeks. I got my boat cruise (not the Alaskan Cruise, but on the Danube which I had planned with a friend who had passed away before we could see it). I got my train trip (two actually), I walked the Coliseum (oh yes, it was at the end of our street in view of our hostel) and the Vatican. I walked Pompeii and marvelled at the amazing lost city. 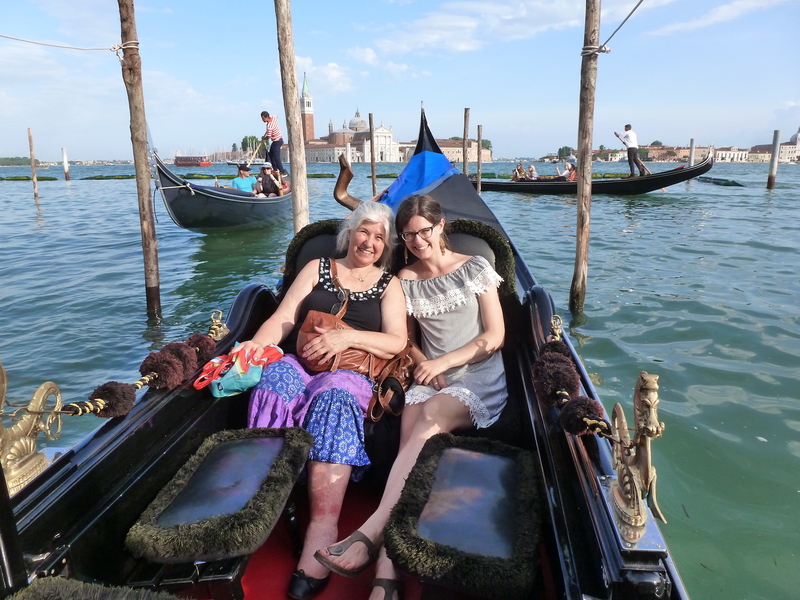 I took a gondola on the canals of Venice and visited the lace museum in Burano. We experienced the amazing city of Vienna and the Matyas heritage in Budapest including public baths and the Matyas church and castle. Wait, what’s that we spy from our front door? Could it be… ??!! As a grand finale, we took a train to Lviv, Ukraine and then drove to Lanchyn where I was able to once again see my dad’s village, walk the roads that he walked, sit for dinner with his family. What an adventure! I am so grateful to have had this chance to see all I did. Kudos to Sara who planned all this in spite of writing exams and doing those things required to complete her MD. Challenge should have been her middle name because she most certainly meets the challenge. However her middle name is even better: Hope. Without the Hope, we don’t have energy for future plans. And so I say “Thanks for the memories.” It was an awesome experience of a lifetime! When I first visited Vienna and had the privilege of touring the Schloss Schönbrunn summer palace, I was struck by the rose gardens in the palace park, the delicate explosions of colour and the delicious perfume of the blossoms olfactible from blocks away. While it was lovely to wander throughout the gardens with Josh, my recurring thought was how much I would LOVE to share the experience with my avid gardener of a mother. 4 years after that first visit, it was incredible to walk to the entrance of the gardens with my mom and see her awe and bliss, much as I had imagined all those years ago. Let it be known that her capacity for awe and bliss were even more admirable since mere hours earlier, we had just gotten off a train, found our hostel and dropped off our luggage, and figured out public transit to come straight to Schönbrunn since we weren’t able to check in for another few hours. Not only was my mom game for wandering the gardens after such a morning, but she also toured the imperial apartments and hiked up to the Gloriette! The next morning, we made our way to the Naschmarkt and spent the morning finding Austrian culinary treasures to tuck away for future family Christmas presents… as well as for our imminent enjoyment in the form of a picnic dinner. Our afternoon was languidly passed in Stephansplatz, shopping, sipping coffees and Spritz, and admiring the endless graceful corners and facades of Vienna’s many architectural gems. Finally, we stationed ourselves just outside the Staatsoper (Vienna State Opera House) on the Ringstrasse. As twilight settled around us and the crowd swelled, we delighted in our simple yet luscious dinner of Naschmarkt smoked hazelnut salami and black truffle gouda, with burstingly-fresh strawberries and tangy dried watermelon for dessert. The day felt restful yet extravagantly lovely… much like Vienna itself. An unexpected friend in Stadtpark!